This was the biggest Disrupt ever. While about 150 speakers got on stage, our focus was on Expo Hall. The Hall hosted over 550 startups, divided into different verticals each day of the event. It was an intense yet fruitful 3 days exploring the current trends in AI, Fintech, Blockchain, HealthTech, AR/VR and IoT. The first day was all about Artificial Intelligence. While there is still time until the AI becomes a commodity for every product or other technology, we keep seeing sections devoted to it. There were notable startups dealing with but not limited to real-time collaborative speech to text, explainable decision making, smart factories, and better customer service. It was interesting to come across AI startups focusing on topics that have been discussed since the beginning of the AI hype. There were quite a number of solutions assisting human-driven processes rather than replacing the human task completely and solutions that can explain the reasoning behind their decisions. On the AR/VR side, the startups mainly focused on sales and training solutions, some of them leveraging machine learning and AI algorithms. The outstanding companies, however, were the ones that build devices helping users create their own content. With such hardware like shareable 360-degree cameras and headphones recording 3D sound are becoming easily reachable, we can expect the era of AR/VR to come earlier than expected. Disrupt SF hosted the rise of the health tech this year. There were a lot more companies present compared to previous years. It seems that entrepreneurs have discovered the problematic world of the health industry. The startups focused on a variety of smart solutions to problems and the trend will probably continue as there are still plenty of problems waiting to be solved in this area. 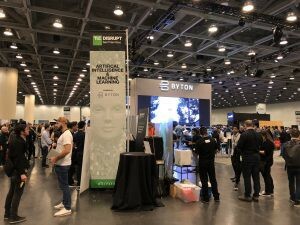 The event hosted startups as well as attendees from all over the world, and the country pavilions aroused great interest. Japan and Korea were the leading countries that had well-curated startup exhibitions. Austria, Australia, Brazil, Lebanon, and Bahrain was also among the countries that showed how they care about the importance of technology investment. We believe technology investment should be a top priority for the growth of a country and hope that we can see a Turkey pavilion next year in Disrupt SF and other big events, where lots of investors meet with startups. At the end of the third day, we were exhausted but satisfied as we had met a significant number of promising startups to engage in future projects we are running for Isbank’s digital transformation. Please contact us to learn what startups we do have in our network that can help your digitalization journey.